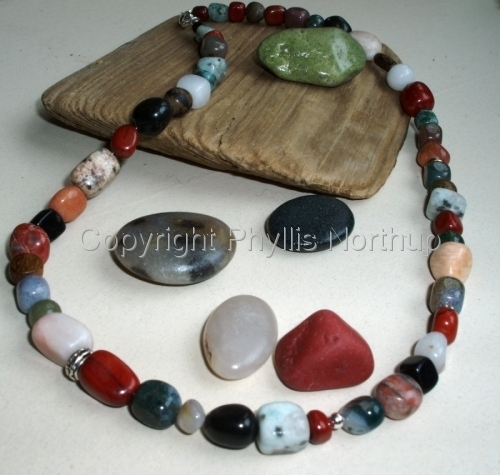 Inspired by our beautiful Lake Superior beach stones, this necklace design is reminiscent of a walk along the lake finding rock nuggets of all shapes and colors as well as driftwood beautifully weathered by wind and waves. Stones in a random pattern will include various jaspers, agates, quartz, and blackstone, with accents of wood, sterling, copper, and brass. Finished with a sterling clasp, each is as unique as the collection of rocks you might find walking along the beach! Bracelets are also available Price includes shipping.